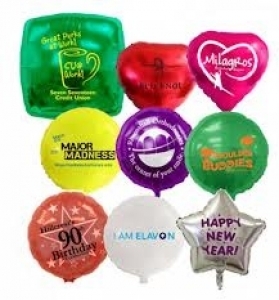 Many companies will no longer allow "rubber balloons' due to latex allergies. I have worked for 4 companies that got sued and lost because they used latex balloons for some purpose and someone got sick. In my opinion, this is one of the worst ideas to have made it to market since the Edsel. When they get away (and they often do), they hit power lines and cause outages, or attract birds who choke on the shiny treats, and they'll never decompose in the garbage landfills. What ever happened to plain old rubber balloons? We blew them up with our own breath, and rubbed them on our clothes to get them to stick to the wall. And they made great water balloons!